There is a belief that just as medicine cannot be taught or learnt without exposure to wards and clinics, pharmacology cannot be taught without experimentation in animals. However, with changing trends in teaching methods and practices, it is increasingly felt that animals should not be sacrificed just to acquire skills and techniques of experimentation. These experiments are expensive, time consuming and tedious. , Also, the availability of animals is becoming sparse. 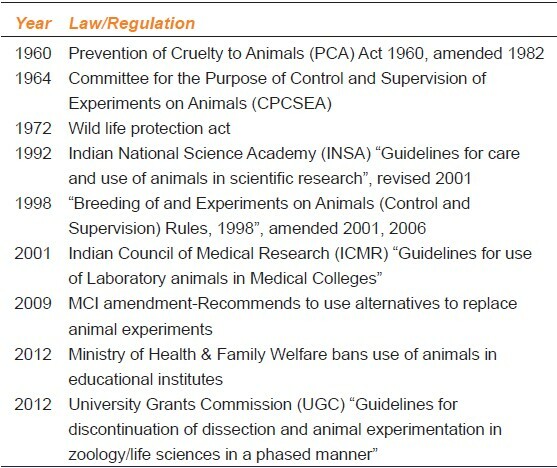 Guidelines by Committee for the Purpose of Control and Supervision of Experiments on Animals (CPCSEA), University Grants Commission (UGC) and the Medical Council of India (MCI), suggest 3 Rs i.e., replacement, refinement and reduction in animal experiments, with the fourth R added, that is their rehabilitation, as an added measure for their care. ,, In this changing scenario, development of alternatives are the need of the day. The use of live animal experiments is decreasing in many medical colleges across India. These are gradually being replaced by certain alternatives that are available at relatively low cost and with proven educational efficacy. In this review, we discuss the evolution of the use of animals in education and research and how these have been affected in recent times owing to concerns from animal lovers and government regulations. We also discuss certain viable alternatives to animal experiments. The number of animal used in teaching varies from 1% to 10% of total animals used. Most of the animals used are small rodents. These are mostly used for fundamental biological research and breeding purposes. Most animals are used in only one procedure and are less commonly reused. These laboratory animals are obtained from various sources in different countries. The sources also vary based on species required. These experimental animals are mostly obtained through breeders. However, at some places these animals might be caught from the wild areas or from auctions. In India, animals have been mostly provided by small time traders, until a few years ago, after the CPCSEA guidelines were modified and affected, which bans the procurement of animals from unauthorized sources. Cosmetic testing on animals is particularly controversial and involves general toxicity, eye and skin irritancy, phototoxicity and mutagenicity. , The famed cosmetics giant L'Orιal, had said it would respect the ban and "no longer sell in Europe any finished product with an ingredient that was tested on animals". Cosmetics testing is banned in many countries, including the Netherlands, Belgium and the UK. The European Union (EU) approved a near-total ban on the sale of animal-tested cosmetics from 2009. However, companies were allowed the sale of animal-tested products if the tests were conducted elsewhere. As of 11 March 2013, cosmetics tested on animals can no longer be sold in Europe, even if the testing was done outside Europe. Since then major companies have completely stopped testing of cosmetics in animals. Necessity being the mother of invention, superior, cheaper and more effective non-animal methods have been developed for this purpose. Preclinical toxicology tests use one million animals every year in Europe, which are about 10% of all procedures. For each chemical test, approximately 5000 animals are used. , The most stringent tests are reserved for drugs and food. A number of tests are performed, lasting less than a month to years to test general toxicity, eye and skin irritancy, mutagenicity, carcinogenicity and teratogenicity. , These toxicity tests provide critical information for assessing hazard and risk potential. The utility of toxicity tests is however debated, since many animal toxicity tests do not accurately reflect toxicity in humans, with false positive results being a particular problem. , Alternatively, false negative tests, as in the case of thalidomide toxicity in rodents are also observed. Poor reproducibility of Draize test in rabbits, poor extrapolation of safety of acetyl salicylic acid, citalopram and recombinant antibodies from animals to humans are other examples that validate this fact. To add to this, withdrawal and ban of a number of drugs in recent years including rofecoxib, which was proven safe in animal testing highlight these legitimate concerns about extrapolation of animal test results to human beings. Data from acute tests may meet classification and labeling regulations, but may be of limited value for hazard and risk assessment. Also, high doses of chemicals are used in a small number of laboratory animals to predict the effects of low doses in large number of humans. Hence, opinion is divided on how to use this data in a meaningful manner. Rodents (rats, mice) and non-rodents (rabbits) are usually used in these toxicity studies. , International variation in testing requirements can result in duplication in toxicity testing. For example, within the European Union, the local lymph node assay (LLNA) is the preferred method for assessing skin sensitization potential, whereas guinea pig assays are still preferred in other regions of the world e.g., China. Considering the above facts, it is suggested that International uniform protocols be implemented so as to reduce the number of animals used, if not totally ban the toxicity tests. Is the animal the best experimental system for the hypothesis to be tested? Is the problem under review worth solving? Can pain and discomfort be minimised for the animal? In view of this, non-animal alternatives are being developed wherever necessary. An apparent 40% decrease in animal use and a concurrent increase in use of tissue culture and biotechnology indicate that scientifically valid, non-animal techniques are implementable. The MCI amendment in 2009 asked all medical colleges to use alternatives to animal experiments in the undergraduate medical course. The proposed new curriculum of MCI "Vision-2015" for undergraduates might make it mandatory to have simulation labs for alternatives. Over the last decade, significant developments in the area have been reported internationally and a few countries have constituted specific agencies for promoting the development and acceptance of these alternatives. William Russell and Rex Burch in "The principles of humane experimental technique" proposed that if animals were to be used in experiments, every effort should be made to replace them with non-sentient alternatives. This document published as early as in 1959 also emphasized that researchers need to reduce, replace and refine the use of animals so as to minimize the pain and distress to animals. These "3 Rs" of animal research, were paid little attention initially. However, they have influenced new legislations aimed at controlling the use of experimental animals and are included in the Animal (Scientific) Procedures Act in the United Kingdom and several similar regulations, including the CPCSEA guidelines. , The 3 Rs also found acceptance among those who opposed use of animals for experimentation, thereby rationalizing the debate to some extent. Refinement: It refers to decreased invasiveness, improved instrumentation, improved control of pain which minimize actual or potential pain, suffering and distress. ,, Examples include, non-invasive techniques; using appropriate anesthetic and analgesic regimes for pain relief. The 4 th R i.e., Rehabilitation of the animals after their use, is also emphasized. Development of alternatives to animal experiments in teaching seems less tedious. These alternatives can be substituted by demonstrations using computer-simulated learning programs. Exercises in the form of graphs, tables obtained from various animal experiments can be used to teach students. They will analyze and interpret these applying different methods, formulae and statistics. After the discussions the learner can draw conclusions and correlate them clinically. Analyzing the results of any experiment or drug trial and drawing conclusions is a good learning experience for students for developing clinical judgment skills. The various alternatives used are mannequins, videos, observational and field studies, materials from slaughter house and fisheries, supervised clinical experience etc. ,, Exact simulation of real animal experiments on a computer is not easy because the biological responses are very complex. Hence, the results obtained with these simulated models may not be very accurate. It is pertinent to remember however, that the aim of the software is to teach the students about salient facts that have practical utility in their future role as decision makers in patient care. The failure rate of drugs in phase I clinical trials is 40% and the process is expensive and time consuming. Microdosing studies enable potential new drugs to be tested safely in humans using ultrasensitivity of accelerator mass spectrometry. The time taken is 4-6 months and this method is relatively cost effective. It provides excellent information about human metabolism. While in vivo (phase 0 microdosing with high sensitivity mass spectroscopy) and in silico (using established human biological data) technologies are increasingly being used, in vitro human approaches are rarely employed. Howerver, it is also worthwile to consider the viewpoints that animal experiments provide an insight into the intricacies of drug action. The pharmacology of the drug unravelled during the preclinical phase of drug development is a prerequisite to understand the potential efficacy and safety of a new drug. Experts also opine that animal experiments are something which very much "belong" to pharmacology; and can serve as an important tool for evaluation of skills, particularly of postgraduate students. On the other hand, experts also opine that while animal experiments may be a necessity for graduates of pharmacy or biosciences, their role is debatable for medical graduates as the objectives can be met with alternative evaluation methods. The debate therfore continues, until suitable alternatives are developed, validated, accepted and implemented. It seems likely that these alternative methods and models will eventually replace intact animal models in pharmacology education, either partially or completely. The stakeholders need to provide timely information and also upgrade undergraduate and postgraduate curriculum in pharmacology, taking these facts into consideration. Regulatory bodies like the MCI, the CPCSEA, UGC, INSA, and the ICMR should finalize uniform guidelines for all educational institutions keeping in view the expected changes in curriculum viv-a-vis animal experimentation. They must not only initiate and encourage the projects for the development of alternatives in education but also ensure their implementation, by providing the requisite infrastructure in all institutions. In doing so, a broad consensus must be developed for removing or reducing the animal experiments from curriculum. As technology advances, these alternatives, especially in vitro and in silico techniques would receive wide acceptance by researchers and regulatory bodies, as well. Whether the in vivo effect observed in animals can be compromised, and if the extrapolation should be entirely dependent on in vitro or in silico data, can be a matter of debate. While a combination of newer in vivo and in vitro techniques do provide viable and cost-effective alternatives to certain pharmacodynamic and pharmacokinetic evaluations of drugs, animal testing is yet required for repeat dose toxicity, carcinogenicity of drugs and certain behavioral studies. Hence, it appears that animals are not entirely dispensable, especially in research, which reiterates the need to practice the principles of 4Rs in animal experimentation and intensify our efforts in developing and validating suitable alternatives to their use. 1. Badyal DK, Bala S, Kathuria P. Student evaluation of teaching and assessment methods in pharmacology. Indian J Pharmacol 2010;42:86-8. 2. Babu CS, Latha K, Thirunavukkarasu J, Tharani CB. Virtual experimental pharmacology an alternative or not? A global assessment by pharmacology faculties and MBBS students. Rec Res Sci Tech 2011;3:25-9. 3. Badyal DK, Modgill V, Kaur J. Computer simulation models are implementable as replacements for animal experiments. Altern Lab Anim 2009;37:191-5. 4. Dewhurst DG, Kojic ZZ. Replacing animal use in physiology and pharmacology teaching in selected universities in eastern Europe-charting a way forward. Altern Lab Anim 2011;39:15-22. 5. Committee for the purpose of control and supervision of experiments on animals (CPCSEA). Available from: http://moef.nic.in/modules/divisions/cpcsea/[Last accessed on 2013 May 25]. 6. Guidelines for discontinuation of dissection and animal experimentation in zoology/life sciences in a phased manner, 2011. University Grants Commission. Available from: http://www.gujaratuniversity.org.in/web/NWD/NewsEvents/8999_UGC%20Guidelines%20for%20Animal%20Dissection%20and%20Experimentation.pdf [Last accessed on 2013 May 25]. 7. Medical council of India, New Delhi, amendment notification of 8 July 2009 to the Minimal standard requirements for medical colleges with 150 admissions annually, regulations, 1999. Available from: http://www.mciindia.org/helpdesk/how_to_start/STANDARD%20FOR%20150.pdf [Last accessed on 2013 May 25]. 8. Bertoloni MD. Early modern experimentation on live animals. J Hist Biol 2013;46:199-226. 9. Animal testing. Wikipedia. Available from: http://en.wikipedia.org/wiki/Animal_testing. [Last accessed on 2013 May 25]. 10. Nuffield council of bioethics. Available from: http://www.nuffieldbioethics.org/animal-research/animal-research-what-animals-are-used-research. [Last accessed on 2013 May 25]. 11. Annual report animal usage by fiscal year, United States department of agriculture, animal and plant inspection service, 2011. Available from: http://speakingofresearch.files.wordpress.com/2008/03/2010_animals_used_in_research.pdf [Last accessed on 2013 May 25]. 12. Statistics of scientific procedures on living animals. Home office, Great Britain 2012. Available from: https://www.gov.uk/government/uploads/system/uploads/attachment_data/file/115853/spanimals11.pdf [Last accessed on 2013 May 25]. 13. Liebsch M, Grune B, Seiler A, Butzke D, Oelgeschla¨ger M, Pirow R, et al. Alternatives to animal testing: current status and future perspectives. Arch Toxicol 2011;85:841-58. 14. IUCN the red list of threatened species. Available from: http://www.iucnredlist.org/search [Last accessed on 2013 May 30]. 15. The recommendations of the sub-committee on rehabilitation of animals after experimentation set up by CPCSEA, 2006. Available from: http://envfor.nic.in/divisions/awd/Rehabiliaion_Guidelines.pdf [Last accessed on 2013 May 30]. 16. Mohammad AA, Mohammed Z, Karukayil JM. Alternatives to animals in education, research and risk assessment: An overview with special reference to Indian context. ALTEX 2013;2:5-19. 17. Dewhurst D, Hemmi A. A survey of animal use and alternatives in higher education in Europe. University of Edinburgh, UK. ALTEX 2012;1:1-14. 18. Animals in scientific procedures, UK Parliament/Chapter 1: Introduction. Available from: http://www.publications.parliament.uk/pa/ld200102/ldselect/ldanimal/150/15004.htm [Last accessed on 2013 May 30]. 19. All noble prizes in physiology or medicine. Available from: http://www.nobelprize.org/nobel_prizes/medicine/laureates/ [Last accessed on 2013 May 30]. 20. Balcombe J. The use of animals in higher education: Problems, alternatives and recommendations. 1 st ed. Washington: Humane Society Press; 2000. Available from: http://www.humanesociety.org/assets/pdfs/parents_educators/the_use_of_animals_in_higher_ed.pdf [Last accessed on 2013 May 30]. 21. Regulations on graduate medical education, 1997 (amended upto 2010). Medical Council of India. Available from: http://www.mciindia.org/Rules-and-Regulation/GME_REGULATIONS.pdf [Last accessed on 2013 May 30]. 22. Badyal D. Practical manual of Pharmacology. 1 st ed. New Delhi: Jaypee Publishers; 2008. p. 73-93. 23. Postgraduate medical education regulations, 2000 (amended upto 2012). Medical Council of India. Available from: http://www.mciindia.org/RulesandRegulations/PGMedicalEducationRegulations2000.aspx [Last accessed on 2013 May 30]. 24. Arora T, Mehta AK, Joshi V, Mehta KD, Rathor N, Mediratta PK, et al. Substitute of animals in drug research: an approach towards fulfillment of 4R's. Indian J Pharm Sci 2011;73:1-6. 25. Vandebriel RJ, van Loveren H. Non-animal sensitization testing: State-of-the-art. Cri Rev Toxicol 2010;40:389-404. 26. Pound P, Ebrahim S, Sandercock P, Bracken MB, Roberts I. Where is the evidence that animal research benefits humans? BMJ 2004;328:514-7. 27. Cosmetics and animal testing: A historic victory. Peta UK. Available from: http://www.peta.org.uk/features/new-cosmetics-law/default.asp [Last accessed on 2013 May 30]. 28. More than a cosmetic change. News feature. Nature 2012;438:144-6. 29. Creton S, Dewhurst IC, Earl LK, Gehen SC, Guest RL, Hotchkiss JA, et al. Acute toxicity testing of chemicals: Opportunities to avoid redundant testing and use alternative approaches. Cri Rev Toxicol 2010;40:50-83. 30. Wilson-Sanders SE. Models for biomedical research, testing and education. ILAR J 2011;52:126-52. 31. Animal testing is bad science. Point/counterpoint. Available from: http://www.peta.org/issues/animals-used-for-experimentation/animal-testing-bad-science.aspx [Last accessed on 2013 May 30]. 32. Mardas D, Mohammad AA, Bas B, Francesca C, Pierre C, Rodger C, et al. A framework program for the teaching of alternative methods (replacement, reduction, refinement) to animal experimentation. Altex 20;28:341-52. 33. Liu Z, Liu J, Wang F, Xu G, Hou J, Wan X, et al. Improvement of local lymph node assay for cosmetics safety evaluation [Article in Chinese]. Wei Sheng Yan Jiu 2009;38:585-9. 34. Richmond J. Refinement, reduction, and replacement of animal use for regulatory testing: future improvements and implementation within the regulatory framework. ILAR J 2002;43:S63-8. 35. Kurosawa TM. Alternatives to animal experimentation v.s. animal school [Article in Chinese]. Yakugaku Zasshi 2008;128:741-6. 36. Report on Enforcement of the Animal Welfare Act. U.S. Department of Agriculture. Available from: http://www.aphis.usda.gov/animal_welfare/downloads/awreports/awreport2005.pdf 2005 Report on Enforcement of the Animal Welfare Act" (PDF) [Last accessed 2013 May 30]. 37. Smith JA, Jennings M. Categorising the severity of scientific procedures on animals. The Boyd Group and the RSPCA, July 2004 RSPCA. Research Animals Department. 38. People for the ethical treatment of animals. Available from: http://en.wikipedia.org/wiki/People_for_the_Ethical_Treatment_of_Animals [Last accessed on 2013 May 30]. 39. Two drug trial men critically ill. BBC news. Available from: http://news.bbc.co.uk/2/hi/uk_news/england/london/4808836.stm [Last accessed on 2013 May 30]. 40. Animal rights [Wikipedia]. Available from: http://en.wikipedia.org/wiki/Animal_rights Animal rights [Last accessed on 2013 May 30]. 41. 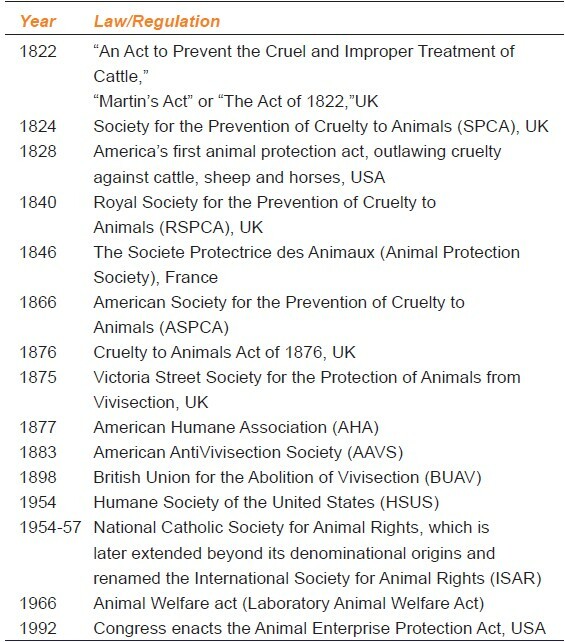 A chronology of animal protection laws. Available from: http://www.animalsandethics.org/chronology.html. [Last accessed on 2013 May 30]. 42. The prevention of cruelty to animals act, as amended by Central Act 26 of 1982. Available from: http://www.moef.nic.in/legis/awbi/awbi01.html [Last accessed on 2013 May 30]. 43. Ministry of social justice and empowerment notification, New Delhi, 1998. The Breeding of and Experiments on Animals (Control and Supervision) Rules. Available from: http://envfor.nic.in/legis/awbi/awbi10.pdf [Last accessed on 2013 May 30]. 44. Guidelines for care and use of animals in scientific research. Indian National science academy. First edition, 1992 revised edition, 2000. Available from: http://icmr.nic.in/bioethics/INSA_Guidelines.pdf [Last accessed on 2013 May 30]. 45. Guidelines for use of laboratory animals in medical colleges. Indian council of medical research, New Delhi, 2001. Available from: http://icmr.nic.in/bioethics/Guidelines_medicalcollege.pdf [Last accessed on 2013 May 30]. 46. Vision 2015, Medical Council of India Available from: http://www.mciindia.org/tools/announcement/MCI_booklet.pdf [Last accessed on 2013 May 30]. 47. Guhad F. Introduction to the 3 Rs (refinement, reduction and replacement). Contemp Top Lab Anim Sci 2005;4:58-9. 48. Validation, regulatory acceptance and international harmonization. Available from: http://alttox.org/ttrc/validation-ra/ [Last accessed on 2013 May 30]. 49. Balls M, Amcoff P, Bremer S, Casati S, Coecke S, Clothier R, et al. The principles of weight of evidence validation of test methods and test strategies. Altern Lab Anim 2005;34:603-20. 50. Wind M, Blakey D, Kojima H, Kreysa J, Stokes W. The international cooperation on alternative test methods (ICATM). ALTEX 2010;27 Spec Issue: 207-10. 51. Table of validated and accepted alternative methods (updated 2013). Available from: http://alttox.org/ttrc/validation-ra/validated-ra-methods.html [Last accessed 2013 on May 30]. 52. Takahashi K, Ishikawa N, Sadamoto Y, Sasamoto H, Ohta S, Shiozawa A, et al. E-Cell 2: Multi-platform E-Cell simulation system. Bioinformatics 2003;19:1727-9. 53. Statement on the scientific validity of the in vitro micronucleus assay as an alternative to the in vitro chromosomal aberration assay for genotoxicity testing. European centre for the validation of alternative test methods (ECVAM), Ispra, Italy, 2006. Available from: http://ihcp.jrc.ec.europa.eu/our_labs/eurl-ecvam/scientific-advice-stakeholders-networks/publication/ESAC25_statement_MNT_20061128_C.pdf [Last accessed on 2013 May 30]. 54. Teaching and learning resources, IndPharnet. Network of Indian pharmacologists. Available from: http://www.indphar.org/xcology.html [Last accessed on 2013 May 30]. 55. CD on X-Cology Pharmacy. Available from: Http://www.bookshelf.co.in/p/7392/cd-on-x-cology-pharmacy-content-aothors-crpatil-drbodhankar-dr-bhise-nirali-publications [Last accessed on 2013 May 30]. 56. Simulated animal experiments in pharmacology. ExPharm pro. Available from: Http://www.expharmpro.com/ [Last accessed on 2013 May 30]. 57. PETA sponsors emantras' virtual frog dissection software for schools and colleges, 2012. Available from: Http://www.petaindia.com/features/Educators-Get-Free-Virtual-Dissection-Software.aspx [Last accessed on 2013 May 30]. 58. Stewart AM, Kalueff AV. The Developing utility of zebrafish models for cognitive enhancers. Curr Neuropharmacol 2012;10:263-71. 59. Mahmood F, Mozere M, Zdebik AA, Stanescu HC, Tobin J, Beales PL, et al. Generation and validation of a zebrafish model of EAST (epilepsy, ataxia, sensorineural deafness and tubulopathy) syndrome. Dis Model Mech 2013;6:652-60. 60. Segner H, Caroll K, Fenske M, Janssen CR, Maack G, Pascoe D, et al. Identification of endocrine disrupting effects in aquatic vertebrates and in vertebrates: Report from Europen IDEA project. Ecotoxicol Environ Saf 2003;54:302-14.